재일 한국인 소프라노 전월선 씨가 대한제국 마지막 황태자비인 이방자 여사의 결혼식 의상 복제품을 들어 보이고 있다. 대한제국의 마지막 황태자 영친왕(英親王·1897∼1970)의 비(妃)인 이방자 여사(1901∼1989)의 일대기를 그린 오페라 ‘더 라스트 퀸’이 한일 국교 정상화 50주년인 올해 일본에서 처음 만들어져 27일 도쿄 신국립극장에서 선보인다. 무쓰히토(睦仁·연호는 메이지·明治) 일왕 조카의 장녀로 일본 왕족인 이 여사는 한때 히로히토(裕仁) 왕세자의 비(妃) 후보에 오르기도 했으나 1920년 일본에 볼모로 와 있던 영친왕과 정략 결혼했다. 일본 육사 출신인 남편 영친왕은 일본 제1항공군 사령관으로 복무하다가 패전을 맞으면서 연합군에 재산을 몰수당하고 어렵게 살았다. 영친왕과 이 여사는 한국 국적이 회복된 이듬해인 1963년 한국 땅을 밟았다. 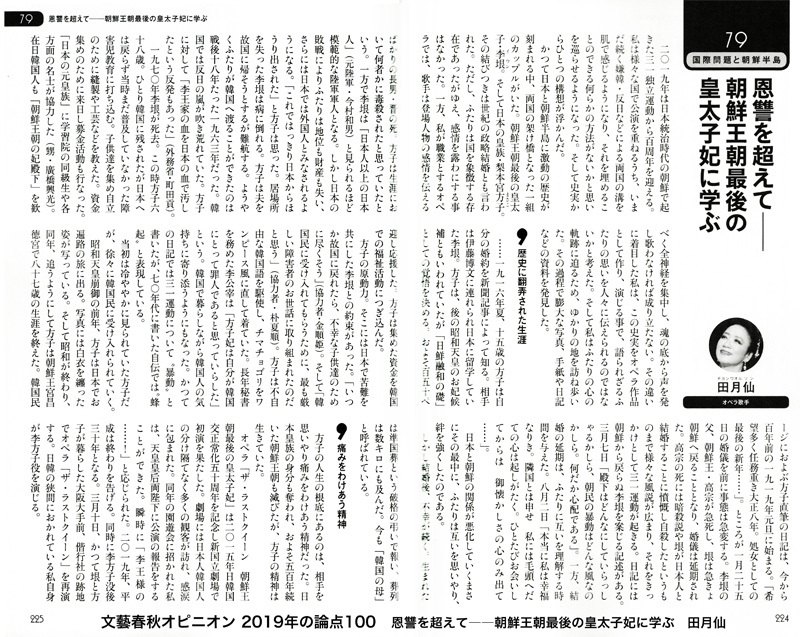 이후 영친왕은 오랜 투병 생활 끝에 1970년 창덕궁 낙선재에서 한 많은 생을 마감했고 이 여사는 홀로 한국에 남아 장애인 봉사활동에 헌신하다 1989년 남편 곁으로 떠났다. 이 여사의 기구한 삶을 오페라로 되살린 주인공은 남북한과 일본 3개국 정상 앞에서 노래한 것으로 유명한 재일 한국인 오페라 가수 전월선 씨. 자신이 직접 관련 자료들을 조사하고 관계자들을 인터뷰해 대본을 썼다. 주연도 맡았다. 전 씨는 7일 도쿄 기타신주쿠에 있는 자신의 음악실에서 가진 인터뷰에서 “일본인이지만 자신의 의사와 무관하게 한국의 마지막 황태자비가 됐던 이 여사의 삶은 재일 코리안의 삶을 거꾸로 비추는 거울이기도 하다”고 말했다. 1시간 40분 분량의 이 오페라는 소녀 이방자가 1919년 신문에서 자신의 약혼 소식을 보고 충격을 받는 장면으로 시작된다. 1920년 영친왕과 결혼한 후 이듬해 낳은 장남 진을 1922년 한국 방문 중 잃고 고통 받는 장면은 극중 하이라이트다. 전 씨는 “이 여사는 마지막까지 장남이 독살됐다고 믿었다”고 말했다. 조선 황실의 혈통을 끊기 위한 일제의 모략이었을 가능성이 있다는 것이다. 이 여사는 1989년 만 88세로 세상을 떠나기까지 좀처럼 감정을 드러내지 않았다. 남편 영친왕은 기록조차 거의 남기지 않았다. 전 씨는 “생전에 두 분이 마음 깊은 곳에 꼭꼭 가둬 뒀던 감정을 노래를 통해 풀어내려 했다. 적어도 오페라에서 두 분의 감정은 자유로워졌다. 넋이라도 달래질지 모르겠다”고 말했다. 오페라 초연에 대한 일본 각계의 관심은 뜨겁다. 주요 신문의 보도가 이어지는 가운데 이 여사의 일족인 일본 왕족들도 큰 관심을 보이고 있다고 전 씨는 전했다. 전 씨는 “‘이 여사의 존재를 처음 알았다’며 놀라는 일본 젊은 세대의 반응에 희망을 느끼고 있다”며 “일본 젊은 세대가 이 여사를 통해 멸망한 조선왕조와 한일 근현대사에도 눈을 뜬다면 서로에 대한 이해와 우호가 깊어질 것”이라고 지적했다. 전 씨는 특히 ‘2개의 조국’이라는 오페라 마지막 아리아를 부를 때마다 가슴이 복받쳐 올라온다고 말했다. 남과 북, 한국과 일본이 교차하는 재일 코리안으로서의 정체성 때문일 것이다. 이 여사가 영친왕의 곁을 끝까지 지킨 것은 일왕의 칙령 때문은 아니었을지 그에게 조심스럽게 물었다. 전 씨는 고개를 저었다. 전 씨는 “재일 코리안으로서 한일 간에도, 남북 간에도 ‘마음의 기적’이 일어나길 고대하고 있다”며 먼 곳을 바라봤다. 재일 코리안 성악가 전월선씨가 9월말 창작 오페라에 출연합니다. 작품 주제는 일본 황족 출신으로, 조선왕조의 황태자와 결혼한 이방자 여사의 인생. 조선반도와 일본 사이에서 30년 이상 활동을 계속해 온 전월선씨. 그런 전월선씨에게 이방자 여사에 대한 이야기를 들어봤습니다. 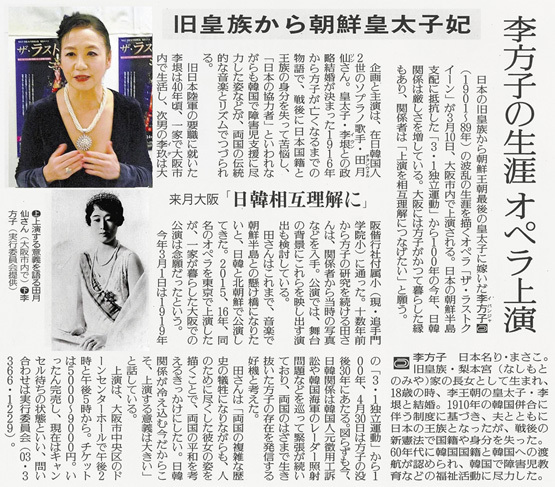 The opera will depict the volatile life of Princess Masako (1901-1989), a member of the Japanese Imperial family who married a prince of the Korean dynasty. 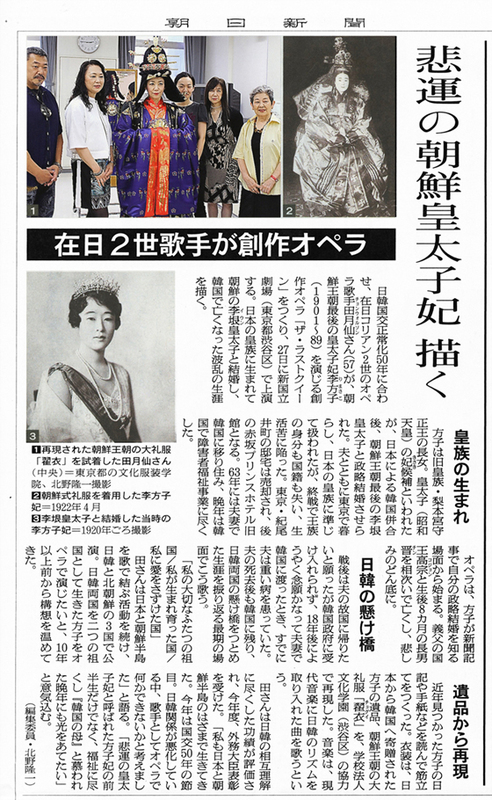 Princess Masako, who hailed from the Nashimoto imperial family, married Lee Eun of the Korean dynasty. Though it was a marriage of expediency, the couple nurtured a genuine love. 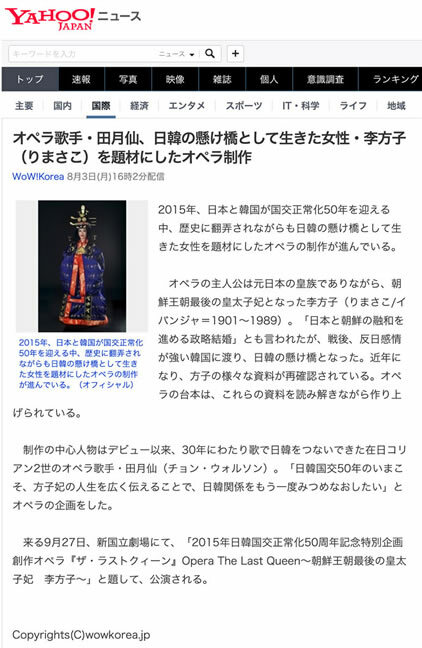 However, the two lost their nationality following Japan’s defeat in World War II. Now that Japan-South Korea relations are thawing, Chon has special hope. 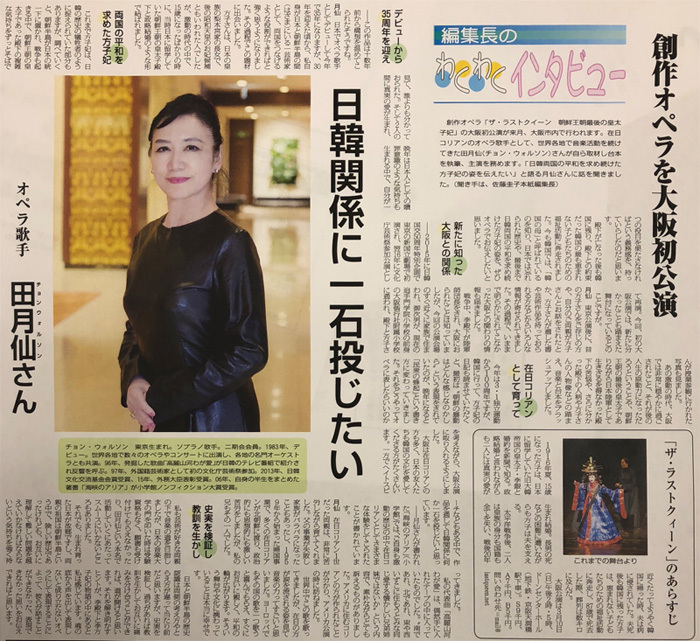 “I want people to learn about Princess Masako, who desired harmony between the two countries, through this opera,” she said. 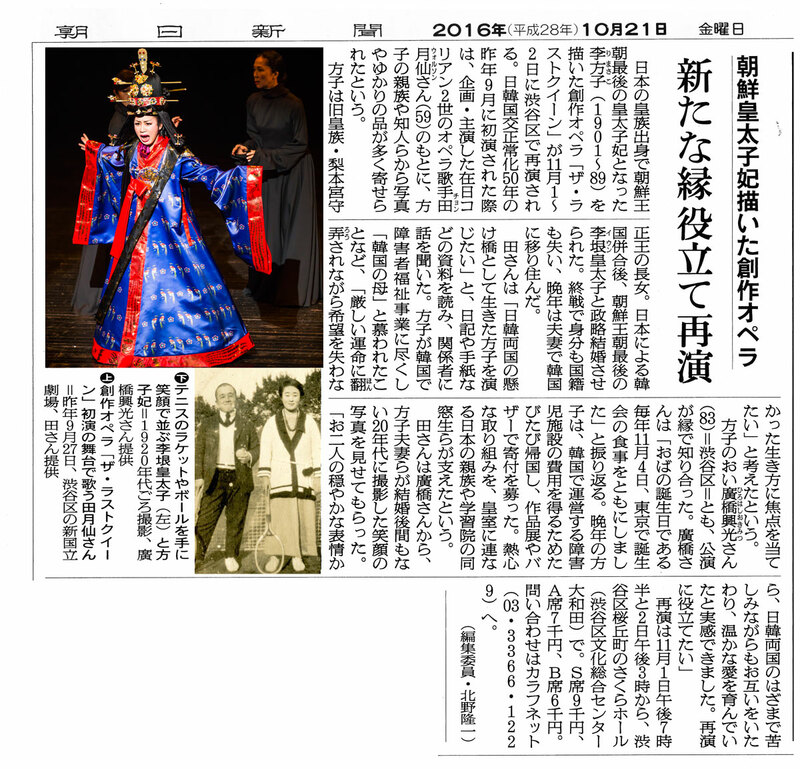 The story starts with a scene in which Masako is shocked to find her engagement to the Korean prince in a newspaper report. The initial highlights of the opera are scenes of her marriage and the sudden death of her first son at a young age. Chon sings about the princess’ agony after her happiness turns into a deep pit of sorrow. 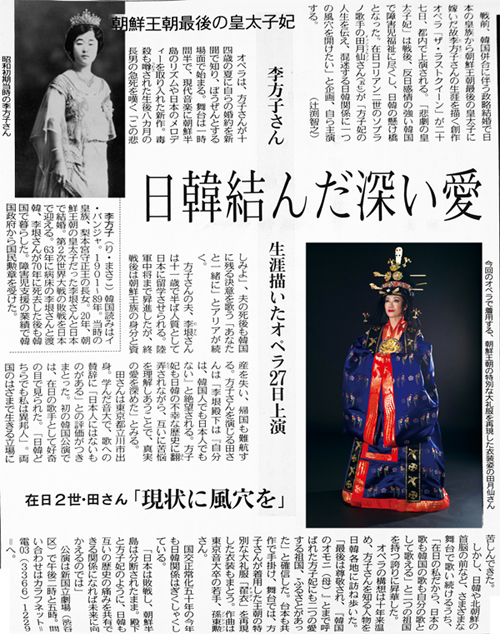 The soprano will wear a reproduction of a dress from the Korean dynasty, which Princess Masako wore for her wedding. 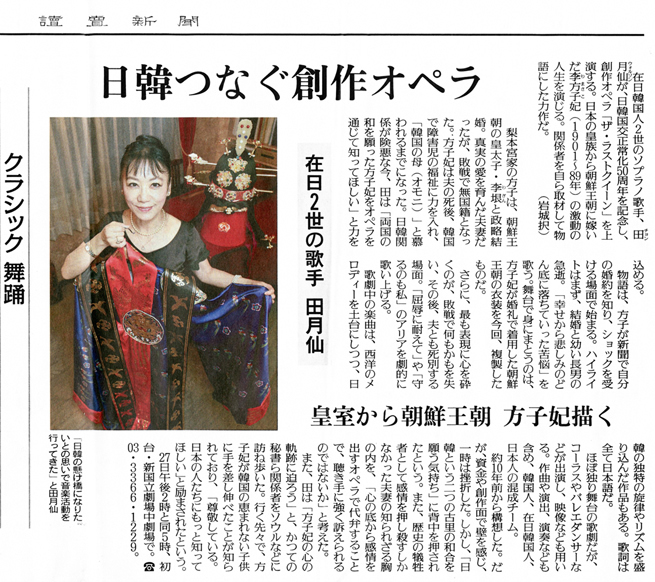 The dress was specially re-created for the upcoming performances. 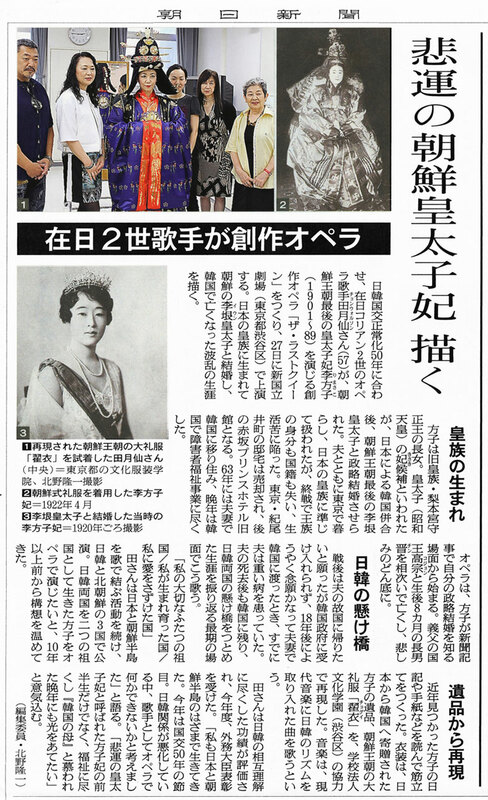 Chon said she is doing her best to delicately express scenes in which the princess has lost everything in Japan’s defeat in the war and the death of her husband. 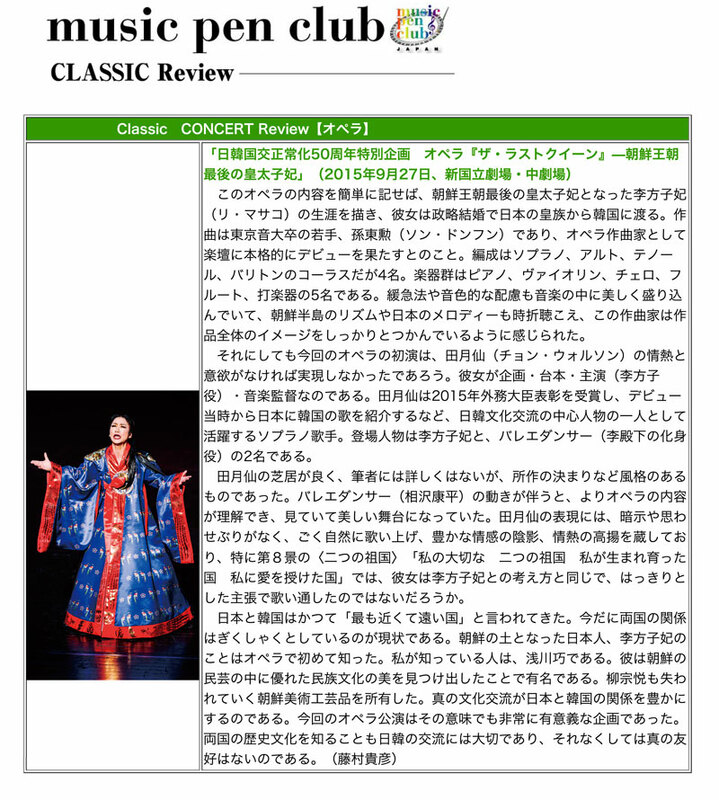 She dramatically sings such arias as “Kutsujoku ni Taete” (Enduring the disgrace) and “Mamoru no mo Watashi” (I will also defend). 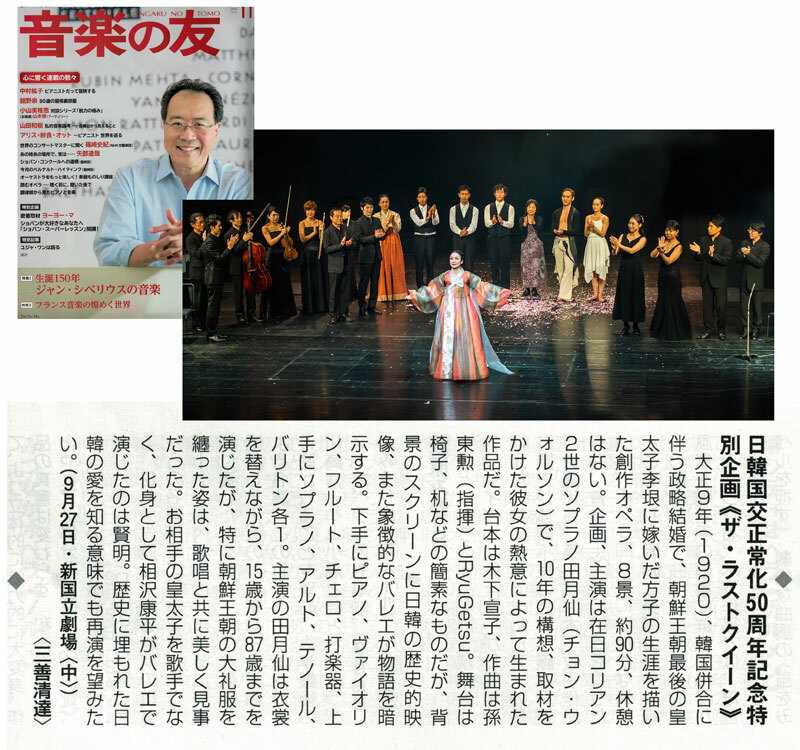 The music in the opera is fundamentally based on Western-style melodies, but there are also works that incorporate melodies and rhythms distinct in Japan and South Korea. The lyrics are all in Japanese. 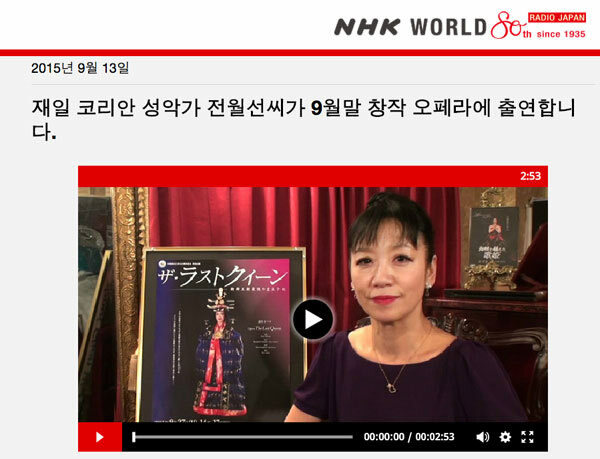 Though the opera consists mostly of Chon’s solo performance, it will also feature a chorus and a ballet dancer and uses video footage. 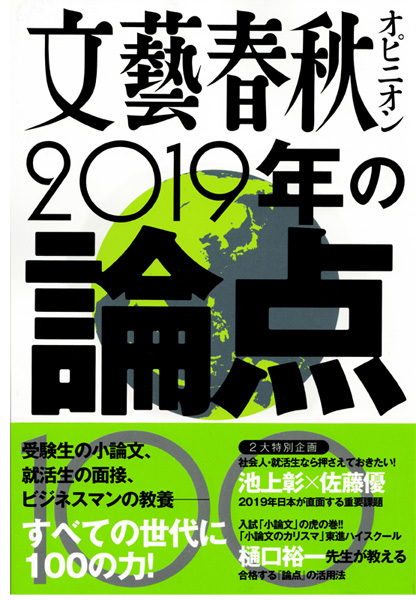 The production team, including the composer, director and orchestra, is a mix of Japanese, South Koreans and South Korean nationals living in Japan. Chon started planning the project about a decade ago. However, she almost gave up once due to obstacles she felt in terms of both funds and productions. 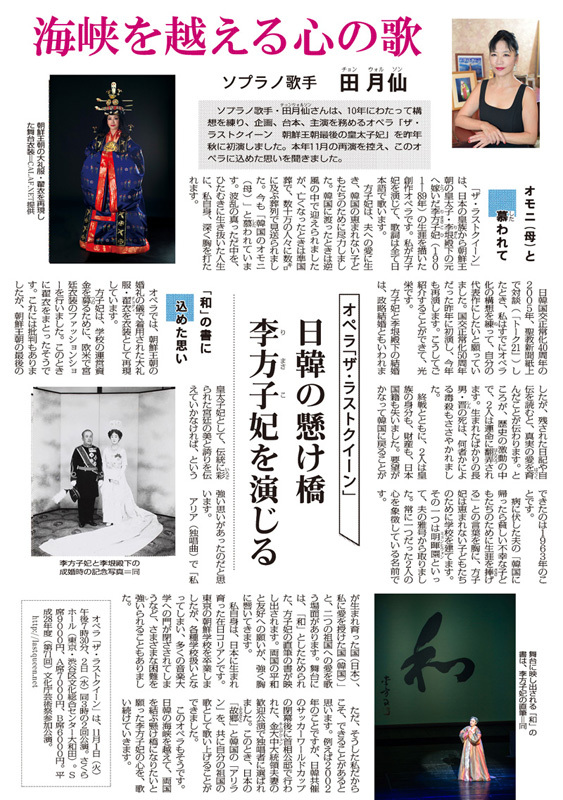 However, she was motivated by her desire to achieve harmony between her two home countries — Japan and South Korea. 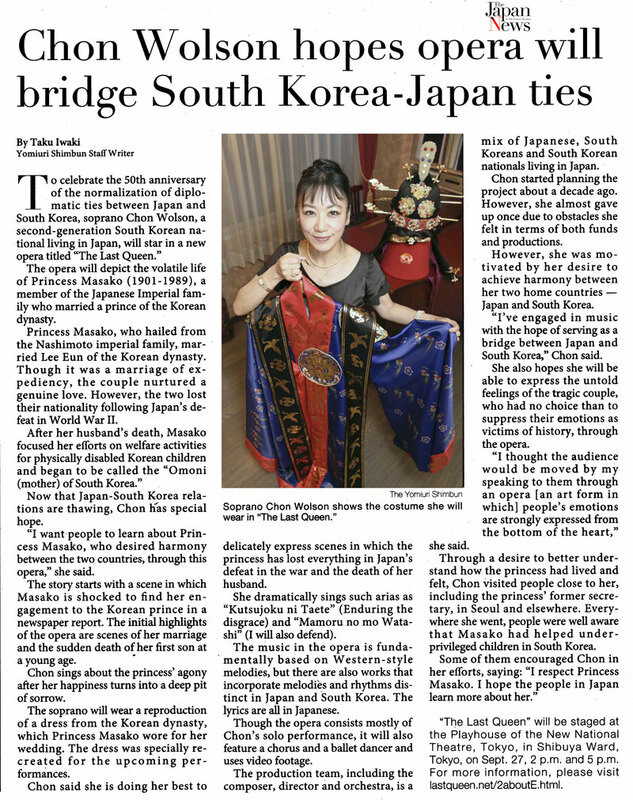 “I’ve engaged in music with the hope of serving as a bridge between Japan and South Korea,” Chon said. 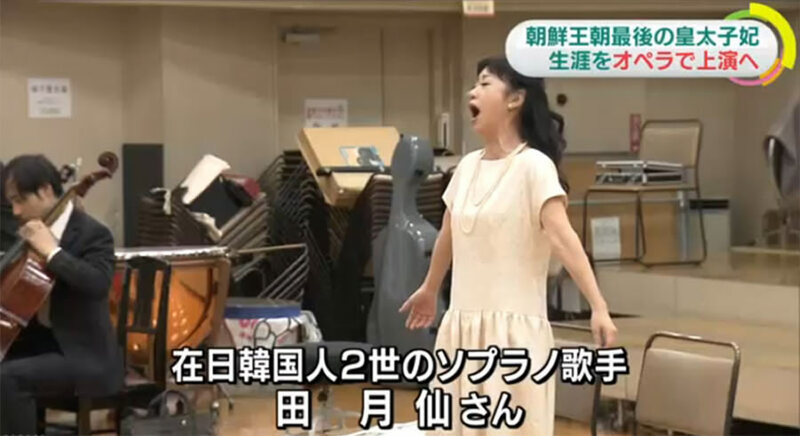 She also hopes she will be able to express the untold feelings of the tragic couple, who had no choice than to suppress their emotions as victims of history, through the opera. 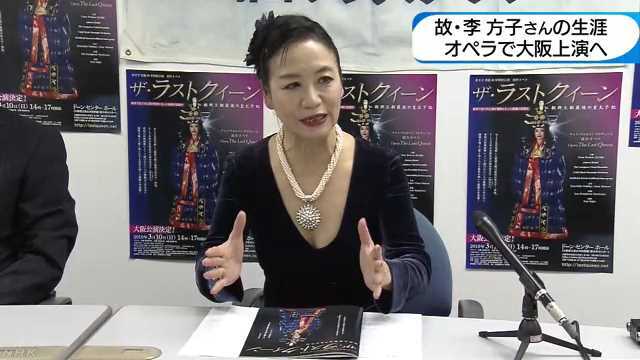 “I thought the audience would be moved by my speaking to them through an opera [an art form in which] people’s emotions are strongly expressed from the bottom of the heart,” she said. 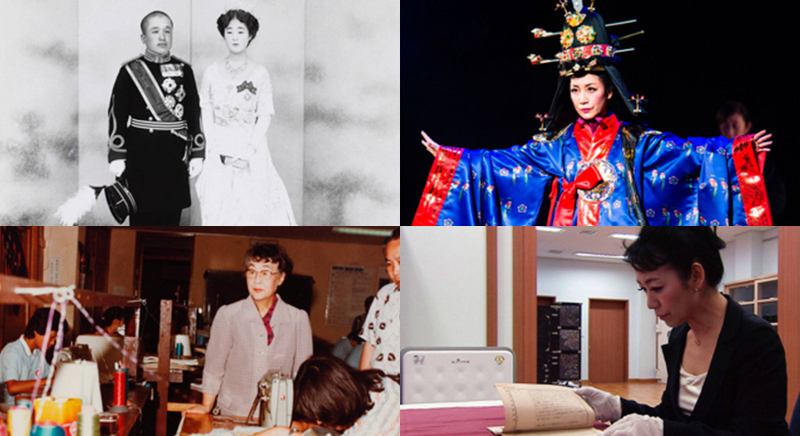 Through a desire to better understand how the princess had lived and felt, Chon visited people close to her, including the princess’ former secretary, in Seoul and elsewhere. 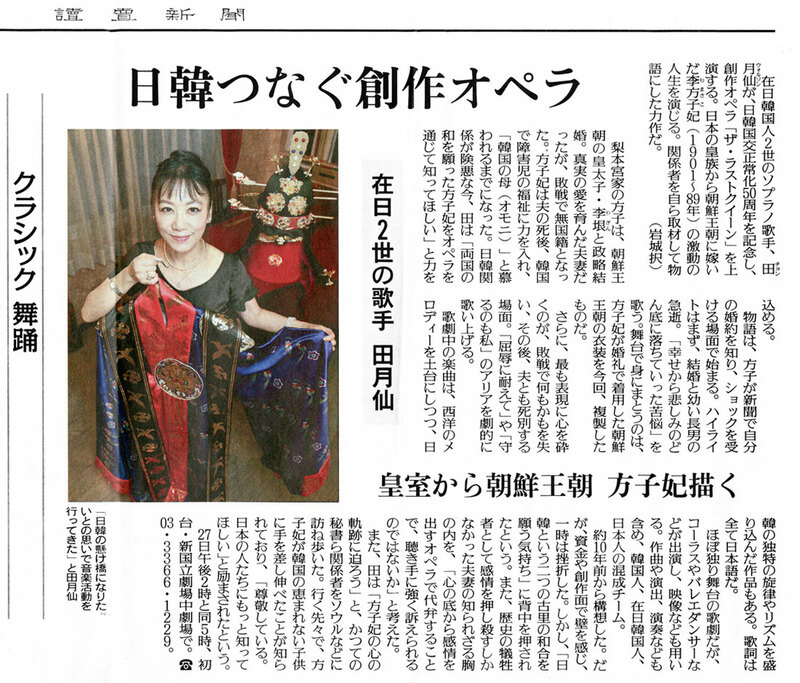 Everywhere she went, people were well aware that Masako had helped underprivileged children in South Korea. "李方子 삶 통해 韓·日 역사 알리고 싶어"
재일 교포 소프라노 전월선(田月仙·58·사진)씨가 대한제국 마지막 황태자 영친왕(英親王) 비(妃)였던 이방자(李方子·1901~1989) 여사의 생애를 그린 창작 오페라 '더 라스트 퀸'을 다시 무대에 올린다. '더 라스트 퀸'은 지난해 9월 한·일 국교 정상화 50주년을 기념해 일본 도쿄에서 초연했다. "한국과 일본의 평화를 기원하는 오페라"(마이니치신문)라는 호평을 받았다. 이방자 여사를 연기하며 각본·연출까지 맡았던 전씨가 재공연을 결정했다. 오페라는 다음 달 1~2일 도쿄 시부야구 문화종합센터에서 공연된다. 이 오페라 마지막 아리아 '두 개의 조국'은 이렇게 흘러간다. 이방자(전월선)는 조선 왕비의 대례복과 궁중 의상을 바라보며 애수에 찬 목소리로 노래한다. 전씨는 "일본 왕족 출신으로 자신의 의지와 상관없이 한국의 황태자비가 돼 외로운 삶을 살았던 이 여사의 삶을 통해 잊힌 우리 역사를 알리고 싶었다"며 "두 조국을 그리워하는 이 아리아에선 감정이 북받쳐 오른다"고 했다. 전씨는 10년 전부터 이방자의 삶을 담은 오페라를 구상했다. "한국을 오가며 생전 이방자 여사를 모셨던 비서 및 관계자들과 인터뷰한 내용을 대본에 담았다"고 했다. 이방자 평전을 여러 번 읽고 작품 속 의상도 전문가 고증을 받았다. 전씨는 1985년 평양축전에 초청받아 김일성 주석 앞에서 공연했고 2002년 6월 고이즈미 준이치로 일본 총리가 주최한 김대중 대통령 환영 만찬 무대에도 선 유명 음악가다. 하지만 아픈 과거를 가지고 있다. 어릴 적 재일 교포 북송 사업으로 오빠 네 명과 생이별했다. 일본에서 태어나 자랐지만 한국 이름을 썼고 이 때문에 일본 음대에서 입학을 거부당하기도 했다. "내 삶을 한마디로 요약하면 '파란만장'이 될 거예요. 대한제국의 황태자비였지만 한국과 일본에서 제대로 대접받지 못한 이방자 여사에게 감정이입할 수 있었습니다. 이 오페라를 한국에서도 무대에 올리고 싶어요."